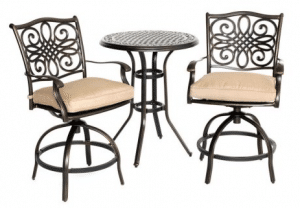 When looking for a taller dining set for your small patio or balcony, look at one of these tall outdoor bistro sets for a solution. The bar height of these sets will give you the feeling that you are dining out at a fine restaurants. 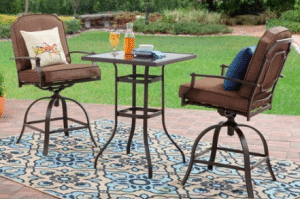 The taller bistro sets are great for dining for two or just relaxing with an adult beverage and a book. Each set will have some different features, so you will have some options to choose what set will work best for you and your outdoor space. Now lets look at some of the details of each of these great sets. The square table top with the sling back chairs are a great design. All steel metal parts are dark brown powder coated for a lasting finish. The sling material on the chairs has a coating for longer durability in the outdoor conditions. I have sling chairs on my front porch and they are very comfortable for long term sitting. The table is 27 inches square and 33 inches tall. The tempered glass top has a smoked finish. Assembly is simple, turn top upside down, insert each leg in the corners. The square support attaches the legs together. No provisions for an umbrella in this table. The chairs are 23 inches wide, 24 inches deep and 42 inches tall. The seat is 19 inches deep, 17 inches wide and 22.5 inches tall from the ground. They will support 250 pounds each. The material for the seat and back is very comfortable, it will dry very quickly after a rain. Assembly of the chairs is in three major steps. First attach the seat to the back with legs, attach each arm to the seat and back then attach the bottom cross bar. Shipping box is 43.4 inches wide, 28.6 inches long, 12 inches tall and will weigh about 60 pounds. Other matching items from the Mainstays Sand Dune collection, see some of my information here. 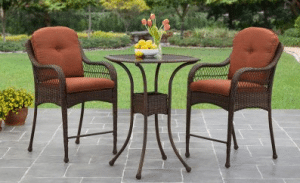 If you like the look of resin wicker, this Azalea Ridge bistro set will work for you. The dark brown powder coated steel frames are covered in a dark brown resin wicker material. The red cushions and tempered glass top will set your outdoor space apart from the rest. The round top table is 28 inches across and 38 inches tall. Assembly for the table will take you to turn the top upside down, attach the four legs to the top and then attach the four resin wicker panels to support the legs. The chairs with the extra tall legs made of powder coated steel covered with a resin wicker. The chairs is 28.5 inches deep, 26 inches wide and 39.75 inches tall. The seat is 18.5 inches deep, 19.5 inches between the arms and 23 inches off of the ground. Each chair will support 225 pounds. Cushions are made from an olefin and polyester material. They are made to withstand sun, rain and other weather conditions. I always recommend storing any outdoor cushions when not in use to extend their outside life. Seat cushions are 2.5 inches thick, back cushions are 2 inches thick. Assembly for the chairs will take attaching bottom and back to one side, attach other side. attach the front support bar and cushions and you are ready. Assembly of this set should take less than an hour, depending on your abilities. The good thing about the Azalea Ridge set is that there is a lot of other matching items in this collection. Look at my article here on what is available as individual pieces or this article for the sets here. This cast iron chair tops and table top sits on aluminum frames. The golden bronze finish will give you that classic look. These chairs will swivel for easy sitting and comfort. The round table is 28 inches across and 32.5 inches tall. It will weigh about 30 pounds. It has an open lattice design in the top. Assembly of table will be to turn top upside down, attach four legs to top and then two support rings to legs. The chairs both swivel and have a rocking motion. The rocking motion is achieved by bars that are attached between the legs and seat base. The spring tension of the bars give a little forward and back movement not a full rocking chair. Assembly of chairs will just be connecting the base to the seat with the four bolts. The chairs are 18.5 inches deep, 24.75 inches wide and 37 inches tall. The seat is 21.5 inches wide between the arms. The leg base is 24.5 inches across. The chair will rock about two inches forward and back. The natural colored cushions are 3 inches thick. They are made from a moisture resistant fabric made to withstand stains and UV rays. My opinion is always store cushions when not needed. You cannot use this set without the cushions. This is a premium set and will look great on a balcony or small patio. This set has a powder coated steel frame, square glass top table and swivel chairs. The design is very boxy looking with the design in the backs of the chairs to all of the supports being square. The table is 27 inches square and 36 inches tall. The glass top has a marble type look and you cannot see through it. Assembly will take the top turned over, four legs installed and then the two square support rings. The chairs are 25 inches deep, 26 inches wide and 44 inches tall. Metal bands will support the seat cushion. Assembly will be to attache the seat portion to the leg portion with the swivel bar. These chairs do not have any rocking motion, if you do you have not assembled properly. Chairs will support 250 pounds each. The medium brown cushions attach to the chair with Velcro straps. This set cannot be used without cushions. This set is very easy to assemble. Other matching items are available in this collection. This powder coated steel frame, with a glass top table and swivel chairs will add to the looks of this set. The chairs have a sling type fabric attached to them, it is not removable like other cushions. This set has the only table that has a hole for an umbrella. I would not suggest going out and getting a big umbrella as the smaller 4 or 6 foot version is all that it will support in any wind even though is has a very wide base. The table is 32 inches square both top or bottom and 36 inches tall. Glass table top and bottom support have holes for umbrella. Assembly will require top to be turned upside down, four legs to be inserted, round then square support installed. When you finish and turn the table up, you can insert the glass top. The glass top has a design that will not be seen through. Chairs have PVC sling fabric that is spill and stain resistant. I find this material dries very quickly when it gets wet. The cushion material is not removable from the chairs. Assembly of chairs is just installing swivel bar to seat, then attaching seat portion to base. Comes in two large boxes that weigh over 100 pounds total. If you are looking to add a splash of color to your outdoor space this set can do that. The cushions come in four colors-red, blue, tan and green. All of the steel frames have the same carbon colored powder coated finish. The square table will have a frosted tempered glass top inset. Glass is not removable from top. The table is 24 inches square and 35.5 inches tall. Assembly is about the same as the others, turn top upside down put legs into top and attach square support. The chairs are 28 inches deep, 24 inches wide and 44 inches tall. They swivel, but do not rock. Assembly is to attach a bar and tube to the bottom of the seat. Then attach the seat to the base, add cushions. Each chair will support 250 pounds. Cushions are the most interesting as they come in the four colors for matching your decor. The throw pillows in the picture do not come with this set. Cushions attach to chair base with Velcro straps. The best part of this set is the four different colors that it comes in. Easy assembly and swivel chairs. If you are looking to set your small patio or balcony apart from others look into one of these tall outdoor bistro sets from Walmart.com. Each set will have some advantages for individual use, each person will have to determine what details will work best for them. I have given you the details of these sets, I like the Azalea Ridge collection the best, what is your favorite. Thanks for reading my article, as always any questions or comments please use the forms below. Great insight John, thanks for sharing. Frankly, all of these look fantastic. I really like the cushion concept, but am a bit concerned about getting them wet. Also, I have never owned a table umbrella and saw that at least one of the tables could handle an umbrella. Are they difficult to maintain? With any furniture or accessory for outdoor living some care will need to be done to keep them looking new. I would store any fabric items when not needed for any long time. Umbrellas can be left out if you put them down and have a cover for them. Having the proper umbrella stand is the most important factor. 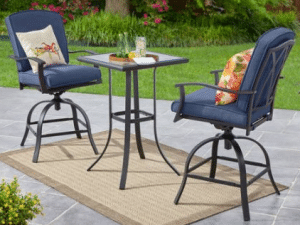 I liked very much the Mainstays Belden Park Swivel High Bistro Set, they look super comfortable and modern, without a doubt they will fit perfectly in my garden. Are they delivered anywhere in the world or is it just for the United States? If you can get stuff from Amazon, these sets are available. The cost is more than at Walmart.com, wich is only available in the US. Great review and selection of products you have provided John. These sets all look good poolside and on back balcony too. Even on a high rise they would seem to be ideal. They all look so great to me, I would have a hard time making a choice. Really well done, thanks for this. The bar height of these sets will make them a stand along set for any outdoor space. Putting a set by the pool will give you a place to sit and drink your favorite adult beverage while drying off after a swim. Once again, amazing job on the article my good friend. 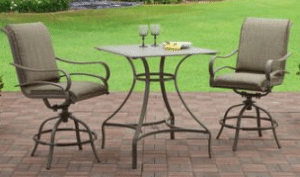 My favorite outdoor bistro would have to be the Mainstays Sand Dune 3-Piece High Outdoor Bistro Set. For some reason I just love brown for my outdoor equipment, ESPECIALLY with dark brown powder coating, as this one has! I also like the extra coating it has to ensure it stays safe against the harsh outdoor environments. They are at a great height as well, awesome! Overall, great chairs if you ask me. This set will require the least amount of work. The sling material dries quickly and the frames will need little work to keep clean. I have a similar set of chairs on my front porch for sitting, they are very comfortable for long term sitting. 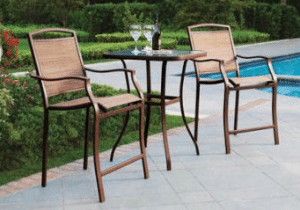 These are tall outdoor bistro sets for a patio or balcony, but you mention putting them within range of a pool? Is there any reason to be concerned about the chlorine getting on them? I kinda like the idea of getting a taller chair that swivels to keep an eye on things and didn’t want to buy something which would just get ruined quickly if it got met with any type of splashing. The chlorine will damage the paint over time, almost any patio furniture will have the same problem by the pool. It would be better to keep a little away from the pool or in an area that does not get a lot of pool water by it. A lot of people use these bistro sets by the pool under a cover to watch the little ones while they swim. Any outdoor furniture will require it own protection from the elements.